Do you have a kid that loves video games but isn’t very interested at reading? We may have found the perfect book series for them! 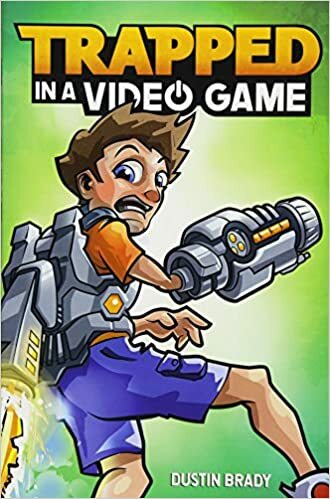 Trapped in a Video Game is an incredible series that follows the young Jesse Rigsby as he navigates his way through the harsh years of adolescence with one major complication — a video game character is trying to kill him. Jesse and his best friend Eric have discovered a new game, Full Blast, and cannot wait to try it. However, they find themselves sucked directly in to the game and find they have to play to survive when a mysterious figure begins to follow them and kill them. The series contains 5 books and each book contains an interactive STEM (Science, Technology, Engineering, and Math) section at the end that allows readers to learn and understand binary coding and algorithms. Now they can understand how their favorite games function and start learning how to create their own video games. One series is helping them to not only nurture a love for reading but also give them the opportunity to learn and practice STEM activities at home for fun! This entry was posted in Activities, Learning, reading and tagged Activities, algorithms, binary code, Books, boy books, coding, l;earning, language arts, literature, math, preteen books, Reading, science, stem, technology, teen books, the boys store, trapped in a video game, video games on February 1, 2019 by Lacy.